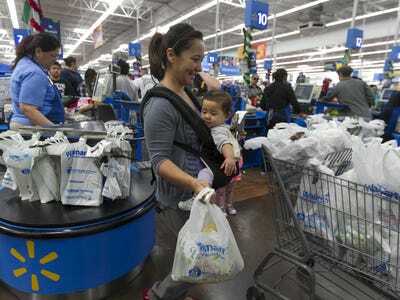 Wal-Mart executives say lower gas prices may lift consumer confidence going into the critical holiday shopping season. “Consumer confidence is reasonable out there, and there is no doubt that lower gas prices are giving us a benefit,” Wal-Mart US President and CEO Greg Foran said in a call with reporters on Thursday. Foran made the remark after Wal-Mart reported its first quarter of positive same-store sales growth in the US in two years. Traffic remained weak for the period, however, falling 0.7% at US stores. Foran said the company is “cautiously optimistic” going into the fourth quarter. Retailers have been slow to rebound from the recession and as America’s largest retailer, Wal-Mart can offer some key insights into the state of the US consumer. But lower gas prices, which are now under $US3 for a majority of the country, are likely temporary. Wal-Mart narrowed its guidance for the year to earnings of $US4.92 to $US5.02 per share, down from its August projection of $US4.90 to $US5.15 profit per share. For the quarter ended Oct. 31, Wal-Mart’s revenues increased 2.9% to $US119 billion — topping analysts’ expectations of $US118.35 billion — compared to the same period last year. The company’s quarterly profit fell to $US3.71 billion, or $US1.15 per share, from $US3.74 billion, or $US1.14 per share the previous year. Analysts had expected earnings of $US1.12 per share for the quarter.